Update or download the Ace mobile apps. 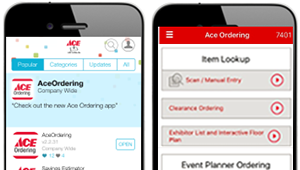 Even though the Atlanta Spring show is a few weeks away, don’t wait until then to get the Ace Ordering mobile app. We have new features that will make your convention experience top notch! In a few simple steps, you can install the update or download the app on your smartphone. If you already have the Ace Ordering App, you can install the update. Open the Ace App Catalog , click the Updates tab and install any updates. Then, open the Ace Ordering app and start using it. No problem! We highly recommend you plan ahead and download the Ace Ordering app now before you get to Atlanta. Download and install the Ace App Catlaog. Set up Trust for the app. Download and install the Ace Ordering app. If you have any questions about the Ace Ordering mobile app prior to the show, please email the Ace Retailer Care Center or call 800-777-6797. If you have any questions at the show, stop by the Get Mobile Booth (located directly behind Welcome Booth #2907) or visit us at the Ordering Hub in Savings Showcase Booth #115. If you haven’t already signed up for the show, register now. See you on the floor in Atlanta!